Plot: A group of four people barricade themselves in a mall to hoping to survive against the recently risen dead. A militant motorcylce gang threatens to ruin their plans. 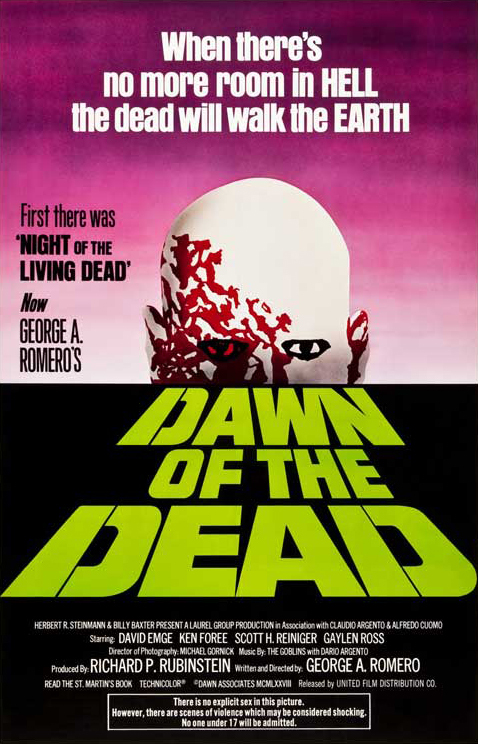 Gory, scary, and sometimes even funny, Romero's classic zombie movie is an effective horror film. "When they is no more room in hell the Dead will walk the earth". What a awesome zombie movie. This is a fun gory horror movie with so many great lines and great sense with it. the visual effect's was stunning and looked really at times to be honest. One of the most iconic zombie films - one that most modern day horror zombie films own homage to. Romero unleashes a plot that is both horrifying (and often instantly and shockingly violent) and rife with social commentary. It certainly isn't an accident that the film's iconic climax is set in a shopping mall, as the film takes not-so-subtle potshots at consumerism and materialism. That said, it's very effective, full of intense acting, and some creepy and scary zombie "crowd" sequences.